Sympatex - Closing the textile loop - Your partner for innovative functional textiles. Munich / Unterföhring, 26 April 2017 – wear2wear is an innovative industrial partnership dedicated to high-quality, as well as sustainable clothing. Five European companies, representing each phase of the recycling process, have joined together to develop cutting-edge production systems that will turn textile fibres from used clothing into new functional fabrics. The sustainable wear2wear concept is synonymous with high-quality, responsible clothing. In Europe, textile fibres from used garments will be used to produce new functional fabrics. Depending on the area of intended use, they also meet strict waterproofing, breathability, protection and comfort requirements. To ensure that the raw material cycle comes full circle, these textiles can be recycled again when they reach the end of their service life. As a result, there is no waste, and they go on to be used in the production of additional garments. All wear2wear partner companies guarantee that – from the quality of the raw materials to the guaranteed recycling end process– these are 100 percent recyclable, functional fabrics made of recycled textile fibres. Water- and dirt-repelling technologies based on renewable raw materials, along with the most advanced membrane technology, will ensure that the textiles are developed and manufactured entirely without the use of PFC in the future too. 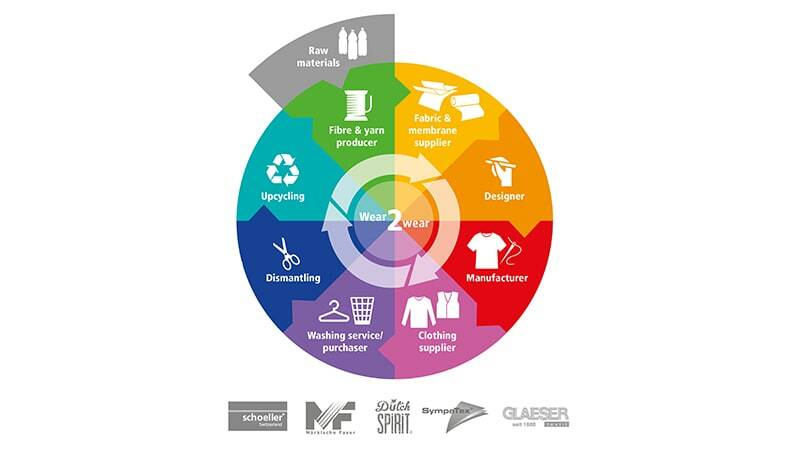 The five European partner companies in the wear2wear cooperation cover the entire recycling circle. Heinrich Glaeser Nachfolger GmbH is a German fibre and yarn producer and the “recycler” in the loop. Märkische Faser GmbH (D) is the “upcycler” and fibre manufacturer. The innovative Swiss company Schoeller Textil AG is responsible for production and manufactures sustainable, high-tech fabrics with maximum clothing comfort. The matching climate-neutral and similarly 100 percent recyclable, PTFE and PFC free membrane as well as recycled outer materials and linings are supplied by Sympatex Technologies (D), the ecological alternative among the textile function specialists. DutchSpirit is a Dutch company which has been dedicated to environment-friendly clothing since 2010. In addition to producing recyclable workwear, DutchSpirit is a Dutch company, dedicated to environment-friendly clothing since 2010, with the mission to significantly increase the awareness for sustainable clothing and provide circular clothing in the corporate and workwear segment. DutchSpirit is the initiator for the development of the Inspire products and brainchild for the wear2wear concept. At Schoeller Textil, the recyclable, functional fabrics from the wear2wear concept belong to the Inspire fabric group. These are high-quality protective workwear fabrics made of 100 percent polyester, which offers the greatest clothing comfort and feels just like cotton. Conforming to the stringent requirements of the bluesign® system, the range extends from antibacterial knitted shirt qualities with outstanding moisture management to more sturdy pant materials with 3XDRY® bio-feelgood technology and very light windproof and waterproof 3-layer laminates, which ensure a high level of climate comfort thanks to the optimally breathable Sympatex membrane. The “guaranteed green” Sympatex membrane is 100 percent recyclable, PTFE-free and PFC-free as well as climate neutral. It is absolutely environmentally-friendly and skin-friendly. Moreover, it is certified in accordance with the strict environment standards Oeko-tex Standard 100 and bluesign®. The water- and dirt-repelling properties are achieved exclusively through the use of the ecorepel® Bio und 3XDRY® Bio technologies, both based on renewable raw materials. In addition to classic colours such as yellow, blue or grey shades, Inspire fabrics are also available in EN ISO 20471-certified high-visibility colours and/or certified according to EN 343 for protection against rain. Due to the exclusive use of polyester fibres, Inspire textiles are very durable, which further helps preserve resources. In addition, their production requires significantly less water and energy.